Derbyshire Falcons produced a dominant performance in the field to seal a convincing 107-run victory at the County Ground. Richard Johnson (58) and Captain Wayne Madsen (above) (37) shared an impressive 103-run stand to help Derbyshire recover from 36-3 to close on 217-8. Durham lost regular wickets thanks to the spin duo of Madsen (3-27), Wainwright (4-11) and Knight (3-36) as the visitors were dismissed for just 110 in the 29th over, sealing a comfortable victory for Karl Krikken's side. The hosts lost the toss and were put in to bat by Durham captain Mark Stoneman. Chesney Hughes seized the initiative immediately, working the ball around well to add 24 off 26 balls, before the hosts lost three quick wickets to leave them in trouble on 36-3 in the eighth over. It was at this stage that Madsen was joined at the crease by Johnson and the two enjoyed a century partnership under the setting sun at Derby. They punished some loose Durham bowling, including dispatching off-spinner Gareth Breese for 31 runs off just four overs, to move the Falcons to 139-3. Johnson completed an excellent half-century from just 58 balls as he looked to take the game to the visitors. Ex-England star Paul Collingwood wrestled the momentum back for Durham when he dismissed both batsmen in a single over. But the returning Tony Palladino shared a late flourish with David Wainwright, smashing three fours and a six from Rushworth's final over. Although Palladino was bowled in the penultimate over by Ryan Pringle, his quickfire 22 off 15 balls helped Derbyshire reach 217-8 after their 40 overs, giving the bowlers a decent total to defend. Durham's reply started slowly, with Palladino and captain Madsen restricting the Dynamos' openers to just five runs from the opening three overs. Madsen's performance with the ball was as impressive as his earlier efforts with the bat, conceding minimal runs and claiming the first three wickets of Stoneman (25), Mustard (0) and Borthwick (7) to reduce the visitors to 60-3 after 15 overs. Collingwood seemed to be putting together a dangerous innings as he reached 24 from 33 balls, but he was eventually undone by the slow left-arm of Tom Knight - who bowled impressively all night. Knight claimed the wicket of big-hitter Ben Stokes soon after, before eventually ending with career-best List A figures of 3-36 off eight overs. 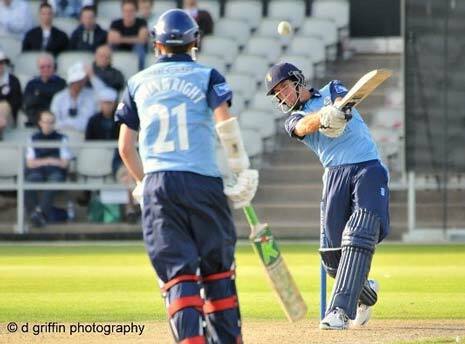 By the time that David Wainwright came into the attack, Derbyshire had a firm grip on the game with Durham at 79-5. And the left-armer ensured that his side would claim the victory in convincing fashion by picking up four wickets in his 4.4 overs, including two with the final balls of the innings. They may be unable to qualify for the semi-finals of this year's competition, but the comprehensive nature of the Falcons' 107-run victory here will certainly boost their confidence as they head into the crucial LV= County Championship fixture with Middlesex at the County Ground, starting next Tuesday, 20th August.